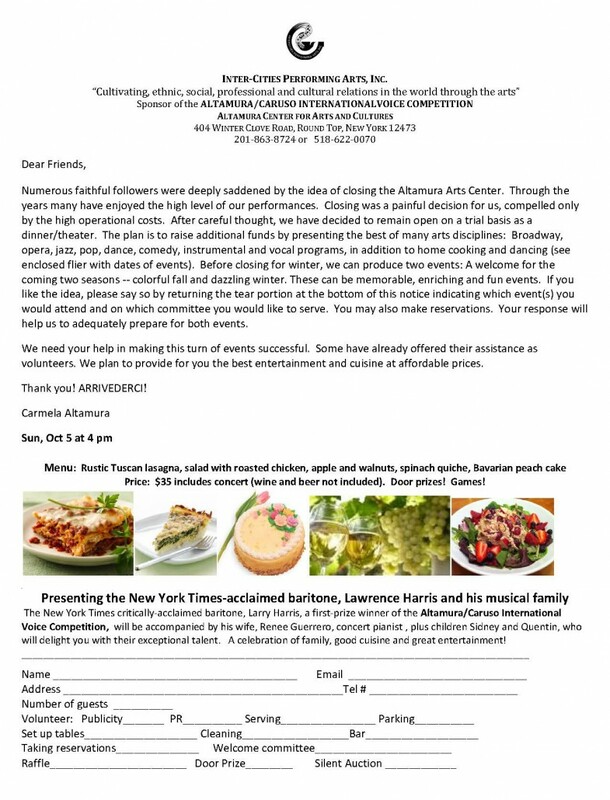 Numerous faithful followers were deeply saddened by the idea of closing the Altamura Arts Center. Through the years many have enjoyed the high level of our performances. Closing was a painful decision for us, compelled only by the high operational costs. After careful thought, we have decided to remain open on a trial basis as a dinner/theater. The plan is to raise additional funds by presenting the best of many arts disciplines: Broadway, opera, jazz, pop, dance, comedy, instrumental and vocal programs, in addition to home cooking and dancing (see enclosed flier with dates of events). Before closing for winter, we can produce two events: A welcome for the coming two seasons — colorful fall and dazzling winter. These can be memorable, enriching and fun events. If you like the idea, please say so by returning the tear portion at the bottom of this notice indicating which event(s) you would attend and on which committee you would like to serve. You may also make reservations. Your response will help us to adequately prepare for both events. We need your help in making this turn of events successful. Some have already offered their assistance as volunteers. We plan to provide for you the best entertainment and cuisine at affordable prices.